“Yam Standards and Guidelines” is developed by the Craft Yam Council of America (CYCA), a trade organization representing yam producers, needle and hook manufacturers. Because you will be seeing these descriptions as members of the industry voluntarily adopt the standards, take a few moments to familiarize yourself with them. Years ago, pattern instructions might have called for a yam simply by name brand, or perhaps as “Shetland yam” or “four-ply yam”. These designations were ail right as far as they went, since there were a limited number of hand-knitting yarns on the market. and everyone understood a “four-ply yam” to be a yam of a certain thickness. Now, however, the number and variety of yarns on the market means that the old designations are insufficient. 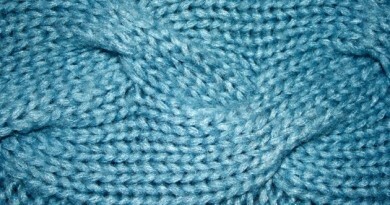 There are super-bulky one-ply yams and extra-fine multi-ply yams, thus the knitter needs more information to make knowledgeable decisions when choosing yarn for a project. At the some time, needle sizing has been confusing. Needles labeled with the same size from different manufacturers might actually be different diameters. In the United States, knitting needles were sized from about 0 to 19. smallest to largest, while in England the sizes ran in the other direction. European metric needle sizing is more accurate, but adds another range of numbers. An American size 10 is the same as an English size 4 is the same as a metric 6mm! Crochet hooks had their own system of letters and numbers. You can see where confusion might ensue. Many patterns did not offer schematics or finished measurements, leaving it to the knitter to guess which size she should make, and how much ease is allowed in each garment. Furthermore, each publisher might make up its own abbreviations for knitting terms, forcing the knitter to adopt a new understanding of knitting jargon with each new project. With input from designers, editors, retailers and other industry trade associations, the CYCA has developed new guidelines. They hope that by standardizing terminology and offering sizing suggestions, they can clear up some of the frustrations that exist for today’s knitters and make it easier for knitters to choose the correct materials to make successful projects. gauges and needle and hook sizes appropriate for yarns in that category. This classification is not an attempt to make yarn producers fit all of their yarns neatly into a particular category. Mary Colucci, Executive Director of the CYCA, says that the committee originally started with many more categories, but worked hard to narrow them down to a manageable number representing the sizes most commonly seen in today’s market. There will always be yarns that span categories, and yarns may be knit with needles larger or smaller than suggested depending on the fabric desired. Finer lace-weight and cobweb-weight yarns favored by lace knitters would fit somewhere on the lower end of the (1) class. While the CYCA stresses that the Yarn Symbol system is not meant to be a yarn interchangeability chart, it may serve as a basis in substituting yams, giving the knitter an idea of whether a certain yarn might be suitable to use in place of the one called for in the pattern. In addition, some publishers have begun to state the exact number of yards needed for a project, rather than just number of balls or total weight of yarn. As always, when substituting yarn, the knitter needs to work a sample swatch to determine if the combination of yarn and needles is right for that project. Classification according to skill is not a new idea, but designers and publishers have never agreed on exactly what makes an “easy” pattern. The CYCA has developed symbols designating patterns Beginner, Easy, Intermediate and Experienced, with a particular skill set described for each level. project “intermediate” instead of “beginner”. Knitters should regard the skill level categories as a hint, and feel free to tackle more difficult patterns if they are willing to learn a new skill or two. 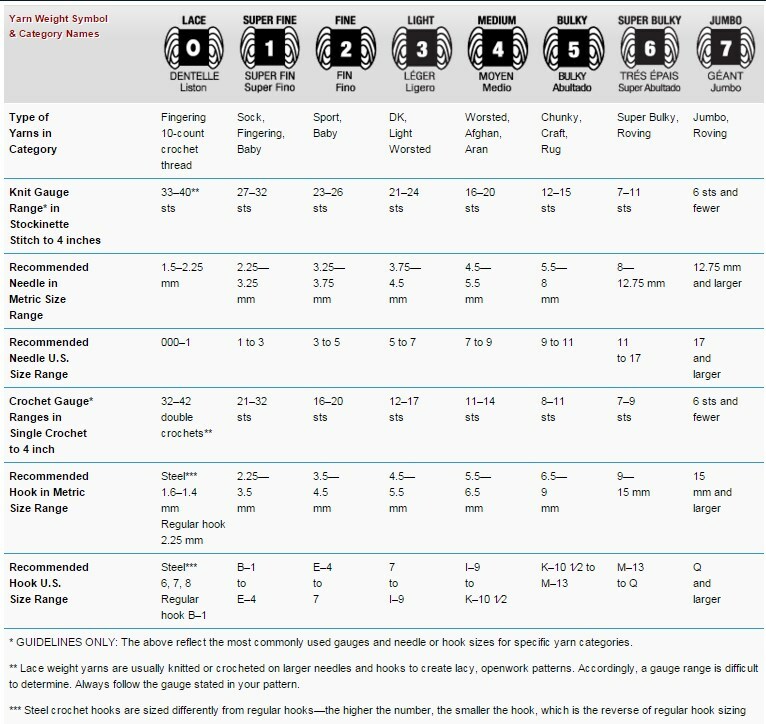 Size charts for babies, children, men and women, as well as head sizes, are included in the Yarn Standards information. These charts were developed from the ASTM International clothing standards and from measurements that publishers previously had been using in their patterns. The addition of ease and fit information with pattern instructions should make it easier for the knitter to understand how a garment is meant to fit, and where adjustments for individual fit might be necessary. 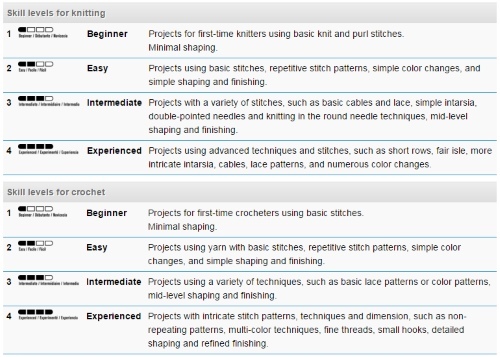 The CYCA has developed a standardized list of knitting abbreviations, which many publishers have agreed to adopt in their publications. Because the millimeter (mm) designation represents the actual diameter of a needle, needle manufacturers who belong to the CYCA have agreed to prominently label all needles and crochet hooks with metric sizes. The “old” US size will also be included. 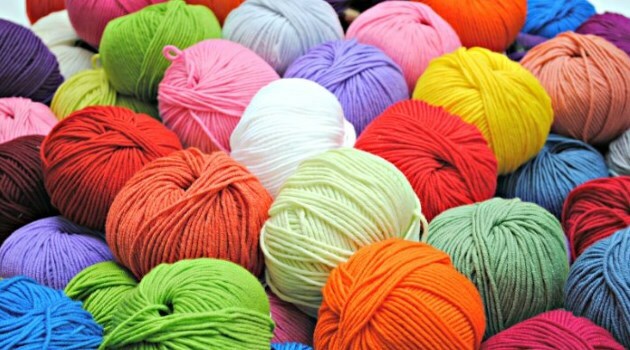 The “Yarn Standards and Guidelines” plan as conceived by the CYCA was not meant for consumer consumption, but was an attempt to bring uniformity to patterns, yarn, and needle and hook labeling. However, as the guidelines began to be used, it quickly became buzz among knitters who noticed changes in their favorite publications. CYCA’s Mary Colucci emphasizes that the report is “an organic document” now in its introductory stage. As manufacturers and publishers receive feedback and offer suggestions to the Council, it is apt to be changed and refined. The Committee is also talking with trade associations overseas in an attempt to get some consensus on these items worldwide. While the new graphic designations are a good way to offer information at a glace, they are no substitute for an educated consumer. They are guidelines, not rules, and as such should be used as a starting point only. Take time to become educated about swatching, gauge, fit, knitting technique, and all the other things that go into a successfully executed project. 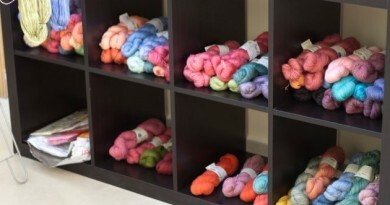 For more information and a complete list of the CYCA guidelines, go to www.yarnstandards.com.